Learn how we make sure each of our new construction homes are 35% more energy efficient than the industry standard! Most often, when you think of an “energy efficient” home, you think of the latest and greatest appliances; heating and cooling systems that promise to cut your electric bills in half; voice-activated technology systems, and a laundry list of other trends and gadgets that reduce our energy bills – or claim to. The truth is, most modern appliances are already energy efficient. So the real secret to saving money is how you build your home. Nearly all your home’s energy costs come from operating your heating and cooling systems. That’s why in the fall and spring your bills are nearly cut in half. We’re not just talking about your actual air conditioner. Adding structural benefits to the gussets of your house is what supports heating and air systems, and drastically lowers the costs of energy bills. Here’s what really matters: Air Penetration or exchanges. Keeping cold air out, and hot air in (or vice versa). How much do you know about the structure of your home? How it was built? And how that construction affects your energy bills? We don’t consider energy efficiency an upgrade. Every home we build has energy efficiency built right into the core of the home. That means no inflated costs. 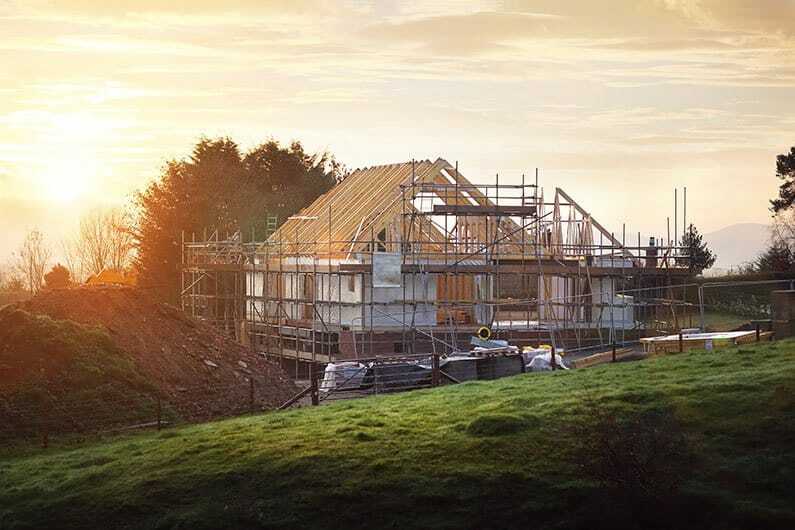 Put simply, we build every one of our homes the way we build our personal houses. For us, energy efficiency is the standard — not an upgrade. On every home we build, we use a Tyvek house wrap system on the exterior of the home. Tyvek keeps moisture and air out of your home, while still allowing moisture vapor to escape. This material “wraps” around the house, and is used before brick and/or siding is in place. It is the most expensive product of its type but is the highest quality we’ve ever seen, which is why we choose it over any other as our standard. 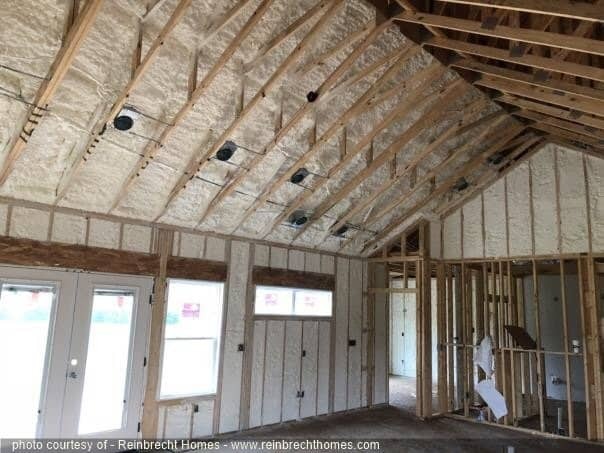 We don’t care if you’re all in for a $130,000 dollar home, or a $1,000,000 dollar home – the insulation we use on the exterior walls of all Reinbrecht-built homes is standard is going to be a product called Spider Plus. This sprayed-in fiberglass product has interlocking technology and fills in the gaps between each 2 x 4 (which are generally found every 16 inches as structural support in most homes). This product will fill all the gaps and will not settle over time. What’s the purpose of Spider Plus Insulation? 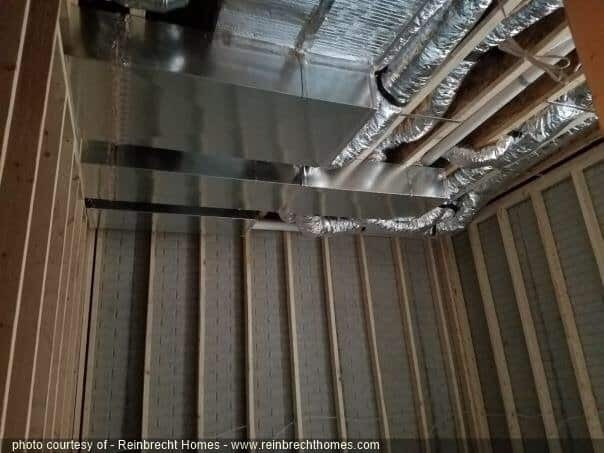 Well, we could use rolled-in batt insulation which is the industry standard, but we know it doesn’t adequately fill in all those gaps and holes that allow cold air to get in, and heat to escape. Additionally, we use a caulking sealant on the inside of all exterior walls to seal any gaps. From the inside of the walls, we caulk the “joints” where your sub-floor meets your walls, between all studs and anywhere else that creates a gap to the exterior. This is something you never see; it exists in the “bones” of the home. But again, it’s all about keeping air from going in and out. This is the blocking that goes above your doors and windows and serves as structural support. As we mentioned, there are 2 x 4s every 16 inches in a home’s structure. This area is an exception, because of the shape and location, so the header board helps support the load of the house above the window or doors, where the 2 x 4s would have been. Typically these are made from standard lumber which allows for heat/cooling loss, but we chose to use an insulated header which consists of two pieces of wood on either side of an insulated board. If we didn’t take this precaution and pay this much attention to these types of details, cold would be able to come in much easier. This is a technique unique that is definitely not standard in the industry. In almost any home, band boards are the number one culprit for air penetration and loss. Band board is the material that covers the space between the floors of your home. There are gaps on this section of the exterior of the home that needs to be insulated. 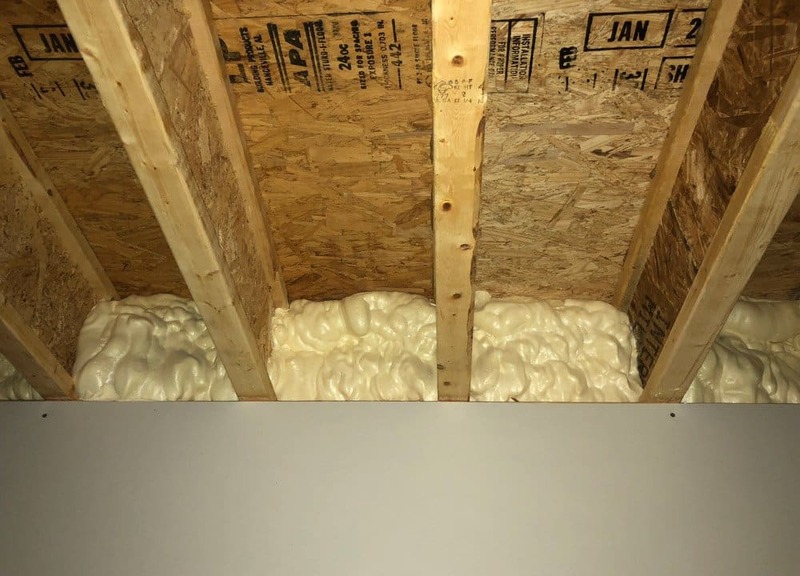 To fill them, we use spray foam insulation – mainly because there is no other product that can get in there as effectively. This spray foam covers and fills all the nooks and crannies. Because there isn’t a wall cavity in the floors like there is the walls, this method of insulation is a MUST for preventing air penetration. Keep in mind, everything we’ve discussed so far is standard practice on every Reinbrecht home, no matter your budget! What Does all this Mean to the Consumer? By creating a standard measurement by which to gauge energy efficiency, the Home Energy Rating System (commonly referred to as the HERS Index) can tell you a LOT about your home. According to the U.S. Department of Energy, most new homes score about 100 (the lower your score, the better) while most resale homes fall in at about 130 on the HERS index. 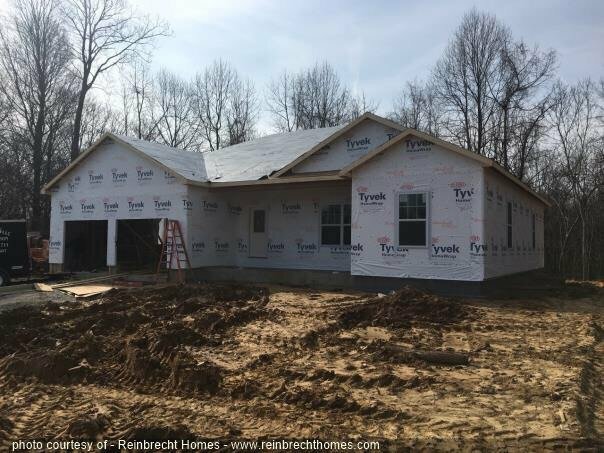 At the time we published this post, we compiled statistics from the last 12 homes we’ve built using the standard features, and Reinbrecht Homes’ average score was 65! This means that – even with our standard construction practices – our homes are 35% more energy efficient than the industry standard and 50% more efficient than the typical resale home. Spray foam insulation is a superior alternative to traditional fiberglass. Granted, fiberglass is still pretty good stuff, but spray foam is even better. The spray foam will virtually eliminate air penetration, but will still allow the house to breathe. Our basements are all poured concrete walls — this is standard. Where most builders leave it at that, basements can actually be further insulated. 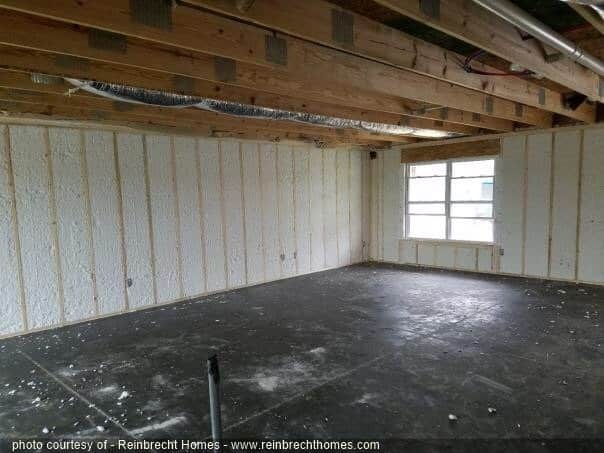 By placing 2 x 4 stud walls all the way around the inside of the poured concrete walls, we create an additional space to insulate. 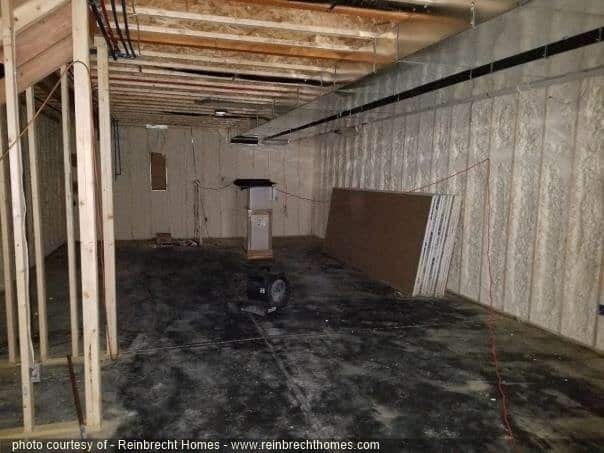 That wall is then spray-foamed, and drywalled, keeping your basement the perfect temperature year-round. Geothermal systems come with a higher price tag, but have been documented to cut energy bills by as much as 65% compared to a standard HVAC system. These systems will eventually recoup the initial cost, but it may take a while, so we recommended investing in geothermal only on your “forever” home. Our standard windows are good, solid windows, and always a grade above industry standard. Splurging on higher quality windows, (instead of your appliances, for example, which are already energy efficient) really makes a huge difference in your energy bills long term. A top of the line window will be aluminum-clad wood compared to the standard vinyl window. These windows typically offer better insulation and do a great job of sealing the opening. over the life of your home. We don’t build homes this way just to save someone a little bit of money up front. Need An Example of What This All Means in Real Terms? In two of our recently built custom homes, we incorporated spray foam insulation, foam insulated walls in the basement, and energy efficient aluminum clad wood windows. Both of these homes have approximately 3,500 square feet of conditioned space and their average all-in energy bill per month is just under $200! Out-of-Pocket Costs During Home Construction New Home Construction Loans, Explained Slab vs. Crawlspace: Get the Most for Your Money Should You Build Your Home Up, Down, or Out? Custom Home Building Timeline What Goes Into A Custom Homebuilding Estimate?